Yu Nandar Aung was part of a successful campaign for HIV funding in her home country of Myanmar. Yu has spent 2012 completing a Master’s degree in HIV, Sexually Transmitted Infections and Sexual Health in Sydney on an AusAID scholarship. In the year she has been away, Myanmar has undergone significant economic and political reform. Hundreds of political prisoners have been released, economic sanctions have eased and the first genuine elections since 1990 have been held, resulting in the election to parliament of pro-democracy leader Aung San Suu Kyi. Just this week, Barack Obama became the first sitting President of the United States to visit Myanmar. Our own Foreign Minister Senator Bob Carr visited in June this year. After more then five decades of military rule and isolation from the international community, the reforms of the past year mean Yu will be returning to a country vastly different to the one she left a year ago. “I don’t know what the country is going to be like when I return in January. I’m excited to see the changes. I have never seen such dramatic changes in my life time,” Yu said. 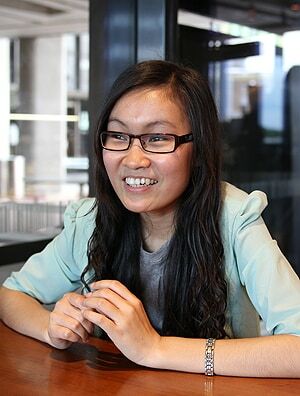 While at the University of Sydney, Yu has played her own part in Myanmar’s reform process. In September, the University’s new Sydney Southeast Asia Studies Centre (SSEAC) arranged for Yu to make a presentation on HIV in Myanmar to a delegation of parliamentarians visiting from the country. The Speaker of the Lower House of Parliament, Thura U Shwe Mann was part of that delegation. The SSEAC will be officially launched by Foreign Minister Bob Carr at the University tomorrow. “It was a very rare opportunity for me to meet with the decision makers in my country. I never thought I’d have the opportunity to meet with people of such high authority,” Yu said. “When the first cases of HIV started to appear in Myanmar in the late 80’s, the government took little action. Since then the government hasn’t paid enough attention to the disease and the infection has spread through the population. “More than 240,000 people are known to be infected with HIV, this number is probably a lot lower than the actual situation because there is a lot of underreporting. Because of the lack of funding, only 25 to 30 percent of people infected with HIV have access to antiretroviral drugs. “These are the hard statistics I wanted to present to the delegation. I knew it was going to be controversial because the government did not recognise much of the problem our country has with HIV. “But I thought I had nothing to lose. I had been told the Speaker was a leader with vision. During my presentation I really believed that, especially when I told him that every year 15,000 people in our country were dying from lack of treatment. He commented that it meant 40 people were dying everyday. When he asked me what can we do to give more people access to drugs, I knew he understood the problem very well. Two weeks after her presentation, Yu was surprised to read in the Myanmar Times that the government had announced US$2.3 million in funding for HIV antiretroviral medication. As part of her degree, Yu has had the opportunity to visit five sexual health clinics. When she returns to Myanmar in January she hopes to apply what she has learnt here. “Australia is famous for HIV prevention. There is a very systematic approach here and HIV has been controlled very well since the beginning. I’ve learnt a lot from the Australian model especially in treatment and prevention. They are things I would like to apply in Myanmar,” Yu said. Her experience in Australia has also influenced her ideas about citizenship and rights. “Here you challenge authority, that is something we didn’t know we could do in Myanmar. But we are a patient people and we have endured a lot to see change,” Yu said.